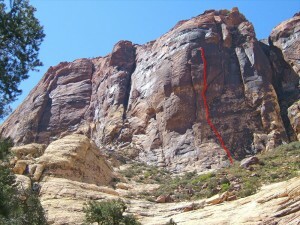 Wild climbing up a dihedral on perfect dark brown rock, the Nightcrawler is shorter than hundreds of other routes at Red Rocks. What defines it is the amazing climbing up a steep dihedral that should be 5.12, but has just enough holds to make it one of the country’s best 5.10 corners. Add to that the position in one of the most scenic spots in Red Rocks – in the midst of the Brownstone Wall, across from the Rainbow Wall, and looking down on the Cloud Tower – and the Nightcrawler earns classic status. Which SuperTopo guidebooks include a topo for Nightcrawler?